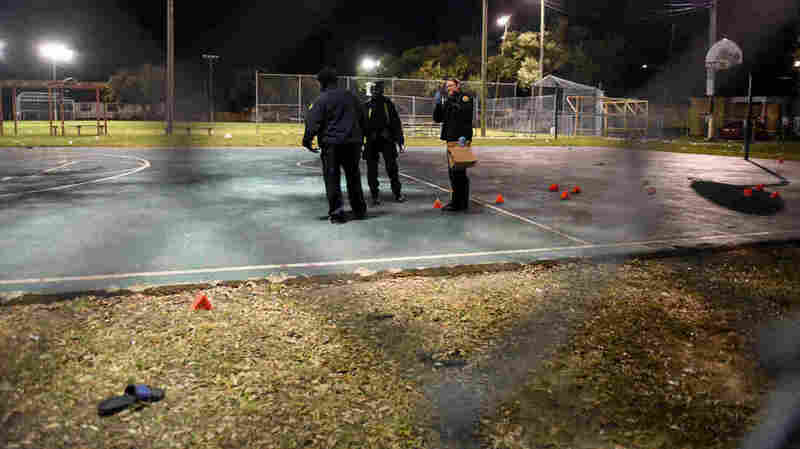 At Least 16 People Injured In Shooting At New Orleans Park : The Two-Way Hundreds of people had gathered at Bunny Friend Playground for the filming of a music video, police say. 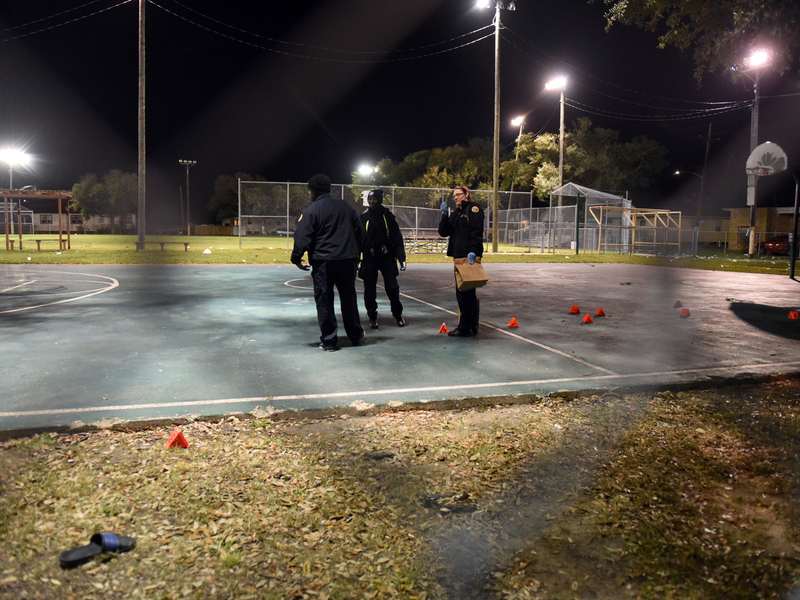 New Orleans police gather evidence after a playground shooting that left at least 16 people injured. City officials are appealing to witnesses for information about the incident. At least 16 people were injured when shooting suddenly broke out in a New Orleans park Sunday evening, police said. Hundreds of people were gathered at Bunny Friend Playground in the city's Upper Ninth Ward to record a music video when two groups began firing at each other, according to the New Orleans Police Department. None of the injuries was described as life-threatening. Ten of the victims were taken to the hospital by paramedics, while six others got there on their own. The Times-Picayune reported that there was a 17th victim, but no additional information was available. "There were hundreds of people, upwards of 500 people probably, in this playground when this erupted. It was an unpermitted, unplanned thing, so we did not know about it until we learned that these people were in the playground, and our officers were then dispatched to come and remove them from the playground." The Times-Picayune released a video of the shooting's aftermath. "That's just not something you can tolerate in the city. And, again, at the end of day it's going to require the people who were in this park to basically say theyve had enough, and they're not going to put themselves in harm's way and give us information so the police can do their job."